The November/December issue of Global Trade Magazine recognizes leaders in Third Party Logistics. 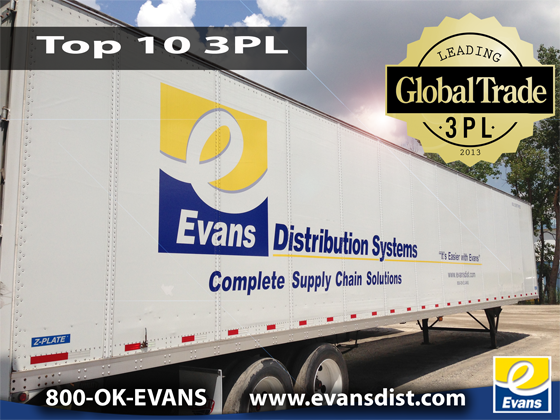 Evans Distribution Systems was named as a Top 10 3PL for small to mid-size companies. The article mentions our warehousing, transportation, value added and staffing services that create a great solution for a 3PL partnership. 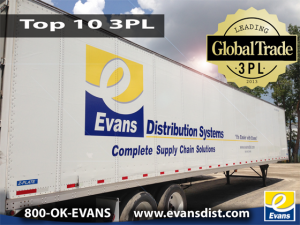 Global Trade Magazine points out that Evans Distribution Systems provides an all-encompassing logistics solution to its customers. With warehousing facilities in Detroit, MI, Norfolk, VA and Itasca, IL, Evans is able to provide short term and long term flexible solutions to customers in multiple geographic locations. The warehouse facilities all provide value added services such as packaging, kitting, bagging, shrink wrapping and quality inspection. Evans also provides transportation services with its asset base and transportation management capabilities. The article mentions the different asset carriers; Alden Logistics, Maverig Freight and Merchants Forwarding Co., as well as Evans Logistics, which provides complete transportation management solutions. To round off the complete logistics solutions’ title, Evans includes a logistics based staffing company, Evans Resource Solutions (ERS). Global Trade Magazine mentions ERS, which provides staffing services in multiple states as well. Evans Distribution Systems now has 30 locations in 10 states across the nation, some of which are dedicated facilities for specific customers.